Wondering what to look for in a SEGA Saturn game now that Saturn game encryption has finally been cracked? Why not one of the biggest multiplayer experiences on the console? Multiplayer Showcase continues to take a look at Saturn Bomberman by covering our favorite stages, gimmicks, exploit the dinosaurs and try to figure out what the kick power up looks like. The round table discussion features my friends Chance, Krys, Randy and Chelsea. (Who didn’t play with us but has actually played the game before!) We talk about the simple wide stage. What are your favorite levels or gimmicks from the game? Do the dinosaurs break the game for you or your friends? Sound off in the comments section. Why stick to fireworks when you can use bombs? A new Multiplayer Showcase installment is out featuring one of the most popular SEGA Saturn multiplayer experiences, Saturn Bomberman starring Hudson Soft’s all-star lineup in a massive free-for-all. We’ll be taking a look at the different stages and examine the differences in the eight and ten player modes, the Saturn’s six player adapter, and how the title holds up to the rest of the Bomberman lineup. This episode is going to be released in smaller chunks which allows the episode to come out faster. Be sure to subscribe to the channel to keep up with new installments and more multiplayer matches. Sega Channel exclusive no more! Sega and Capcom are teaming up to bring you not only Sonic the Hedgehog 1, Sonic the Hedgehog 2 and Super Street Fighter II, you also receive a copy of Mega Man – The Wily Wars which featured Mega Man 1, 2, 3 and an exclusive mini-game under one package. 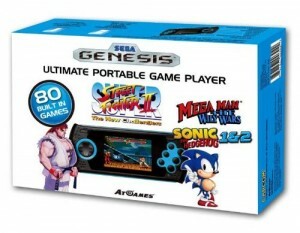 Given the history of portable Genesis/Mega Drive units produced by At Games and Blaze who have also released other ___ Sega games in one Mega Drive units such as the Firecore, also known as the Blaze Sega Mega Drive, it’s highly likely all the games in the package will also suffer a number of sound and graphical emulation errors. 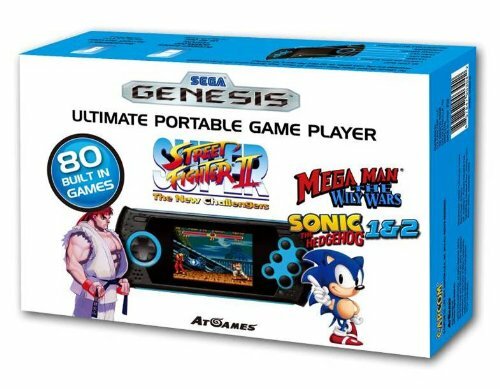 You won’t be getting the perfect experience playing the game, but at least it’s on the go and has 37 games from Sega, 3 games from Capcom and 40 other unannounced titles. The unit is scheduled for release on November 13th. Happy 25th Anniversary Mega Man? UPDATE: As pointed out by Mathuser on the forums, AtGames’ website lists the user manual which also includes the complete list of games included. HACK DETECTED: The manual also shows that they’re still using an older Sonic 2 HD logo. I–should somebody tell them?